In Nashville, voters are deciding on a multi-billion mass transit proposal. Early voting results in Nashville, released just after 7 p.m., show opponents of the mass transit plan with a huge lead, with 65 percent of early voters rejecting the proposal. The lead has barely budged since then. Nashville's transit referendum appears to have driven up voter participation considerably in today's election in Davidson County, compared to a typical county primary day. We'll keep an eye on that vote — and others across the region — and post updates to this page throughout the evening. In an acknowledgement of defeat, Nashville Mayor David Briley said he'll keep pushing to improve mass transit in Nashville and try to put together another plan that can rally wider support. "We all can agree that we have to do something about traffic and transportation, but voters didn't get behind this plan," Briley said in a prepared statement. "My responsibility as Mayor is to get back to the drawing board and find the common ground to develop consensus on a new way forward. Our transportation problems are not going away; in fact, we know they're only going to get more challenging as we continue to grow. I'll get back to work finding a solution for Nashville that we all can agree on." Briley released the statement shortly after Nashville Area Chamber of Commerce CEO Ralph Schulz spoke to hundreds of supporters gathered at the Adventure Science Center to watch results. He urged backers not to give up on transit. He said they needed to "take a breather" but then come back and get to work on a new transit plan to put in front of voters. Shulz later told reporters it will likely take years, as long as a decade, to get back to this point. "It's going to take a while because, you know, some of this is tied to actual, mechanical details of how do you create a transit plan that can be officially offered in the form of a referendum." Shulz spent Election Day going door to door, making a final pitch, and says he did get the impression voters weren't fully convinced that the $5.4 billion light rail and rapid bus plan was necessary. "You know, I got the sense that people want a solution. But they had a lot of different reasons that they didn't necessarily see this as the solution." Steve Bland, the head of the Metro Transit Authority, says he and other leaders will certainly come back to voters with another plan. "I am absolutely certain that this issue is not going to go away. It's going to get bigger. It's got more people's attention, more people's focus," Bland said. "And we're going to have to adapt to that challenge." Bland said the MTA, through its multi-year nMotion process of community meetings, thought that Middle Tennesseans had endorsed an ambitious plan that included bus and rail improvements. And he remained committed to pursuing transit that operates in its own space — outside of traffic. "To just add more bus service that ends up essentially sitting in traffic with everything else really isn't going to be the game-changer that the region needs," he said. The transit chief said the vote does not mean the city goes "back to the drawing board" but must tweak its ideas. "A lot of the underlying issues don't change. Our population growth projections aren't changing. Our development trends aren't changing," he said. State Sen. Bill Ketron holds a sizable early lead over Randy Allen and Tina Jones in the Republican Primary for Rutherford County mayor. Ketron holds 51 percent of the vote, according to early returns, with Allen at 27 percent and Jones at 22 percent. They hope to succeed Ernest Burgess, who is running for Ketron's state Senate seat. No Democrat is on the ballot for the general election. Meanwhile, Sheriff Mike Fitzhugh looks to be well on his way to victory with 80 percent of the vote in the Republican primary. He'd be unopposed in the general election. Williamson County Mayor Rogers Anderson and Register of Deeds Sherry Anderson both have taken big leads in the Republican primary. Rogers Anderson, a 16-year incumbent, took nearly 80 percent of the early voting from challenger Kenneth Eaton. Anderson is unopposed in August's general election. Brentwood resident Jerry Lyle says been satisfied with Anderson's performance. "I voted for Rogers. I'm happy with what he's done so far, and it seems like he's in tune with what's going on." Sherry Anderson holds a narrower — but still substantial — lead. Early voting returns show she took nearly 60 percent of the early voting over Julie Hannah, despite a hotly contested campaign that focused on the Williamson County's rapid growth. Criminal Court Clerk Howard Gentry and Sheriff Daron Hall appear headed toward resounding victories in the Democratic primary, each with more than 80 percent of the early vote. For General Sessions Judge, Division 3, Ana Escobar led early voting with 44 percent to incumbent Nick Leonardo’s 27 percent, with Sheryl Guinn following at 24 percent. For General Sessions Judge, Division 10, incumbent Sam Coleman leads with 34 percent of the vote. Joyce Grimes Safley follows with 27 percent and Frank Mondelli at 22 percent. For Criminal Court Judge, Division 2, Angela Dalton is ahead with 56 percent of the vote to Joy Smith Kimbrough’s 44 percent. For Juvenile Court Clerk, Lonnell Matthews Jr. is ahead at 41 percent to Sherry Jones at 32 percent after early voting. For Metro Register of Deeds, Karen Johnson led early voting with 54 percent, with Richard Exton at 33 percent. During early voting, 59,289 cast ballots — a surprising turnout for many. Earlier today, Elections Administrator Jeff Roberts told The Tennessean that he expects final turnout could reach 110,000. As voting comes to a close, it's clear that many voters are weighing whether Metro had proven the transit proposal is worth its cost. Mary Louise Duncan, a retired businesswoman from northwest Davidson County, came down against the transit plan. "I think that costs too much, and the older people like me are going to have to help pay for it, and I won’t be here to use it," she said. In South Nashville, Lionel Washington decided the plan does prove itself. The employee of General Motors in Spring Hill said he was OK with the tax increases. "I spent time in New York, Boston, and other places, so I think it's a necessary evil. You got to pay it at some point," he said. At stake in Nashville is a decision on what would be the largest-ever civic project — a $5.4 billion buildout of five light rail lines, four rapid bus routes, 19 transit centers and a wide array of other road infrastructure and sidewalk projects over the coming 15 years. The Metro proposal asks voters to approve four tax increases — sales, business, hotel and rental car — which would go into a dedicated funding stream, along with federal grants and city borrowing. These funds are projected to cover construction and operations for 15 years, totaling $8.9 billion. While the vote is divisive, voters today agreed that Nashville traffic is becoming unsustainable. Gary Anderson voted against the plan, saying the congestion problem really lies with the interstates. The retired Nashville native thinks focusing on added bus service — not light rail — would help the most people. "I don't see how it's going to do any good. It'll help people working downtown, but you've got so many people working outside, it ain't gonna do a bit of good for them," he said. But Nashville attorney Brian Pieper said the price is worth it, because it's about much more than just building a mass transit system. "It's really about redesigning our whole intent regarding land use. Where are we going to build the high-density residential properties, and should we put light rail or some other transit along that?" Polls opened Tuesday at 7 a.m. with lines in some locations and only a trickle of voters elsewhere. For many voters, transit might as well have been the only item on the ballot. But one of the other contested races is for a judgeship in a General Sessions court that sees thousands of domestic violence cases each year. The position has been held by Nick Leonardo since the start of the year, and while there are several candidates, his primary competition is considered to be prosecutor Ana Escobar, a fellow Democrat. Vanderbilt law professor Rebecca Allensworth said she wasn't excited the choices but chose Leonardo, the incumbent. "Because I felt like Ana Escobar is on the prosecution side now, and I think we can expect her as a judge to be prosecution-oriented and I think that the deck is already stacked in favor of the prosecution," she said. But Elizabeth M-K Sullivan, who works in communications and has a background in city politics, chose Escobar in part to break up what she calls "a long history of homogeny at the courthouse." "So I was very interested in Ana Escobar being able to become a judge and have a different perspective than we've had in the courthouse before, especially for many new Americans," she said. Leonardo was a sitting councilman when he was picked by the Metro Council to fill the former seat of Casey Moreland, who is currently under house arrest amid a federal investigation. Escobar has received overwhelming support from the Nashville Bar Association and domestic violence advocates. She previously headed the District Attorney's Domestic Violence unit. 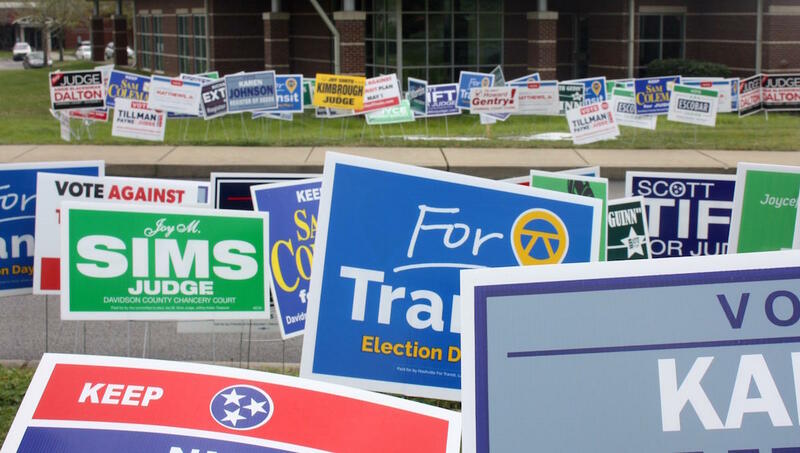 In addition to transit, voters were sifting through candidates in Davidson County's Democratic primary, as no Republicans appear on the ballot. Deciding on the transit referendum hasn't been easy for some. TSU graduate Felisha Williams came down against transit. She said she wasn't impressed that a light rail line would travel into North Nashville, near her former campus. "Actually, at first I supported it. Then, when I read and did research and seen how long it's going to take, and the cost of it," she said, "I kind of felt that they need to come up with a second option." 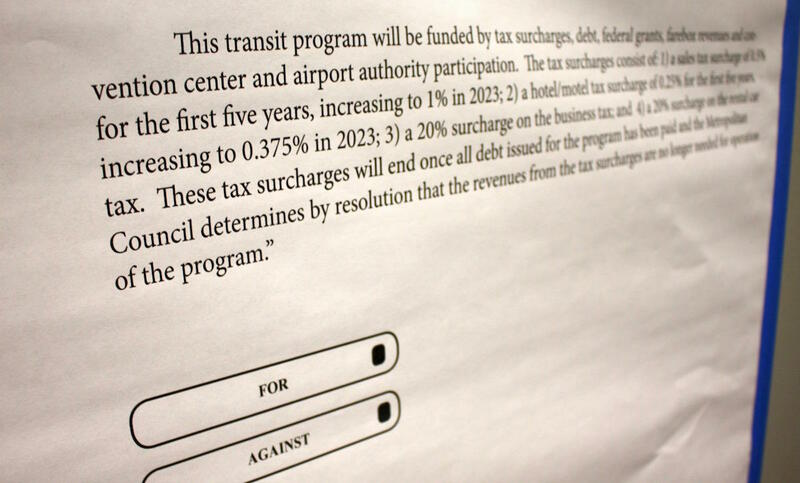 The transit referendum asks voters to approve four tax increases to fund a multi-decade plan. Andrew Krichels, in East Nashville, said he agonized over the plan before casting his vote in favor, as a way to start reaching more underserved residents. He also was alarmed by who was opposing transit. "Part of my decision was who I was voting against. If Carol Swain and Lee Beaman and the Koch brothers are against something, I'm for it," he said. Voters surprised many observers by turning out in force during early voting, with more than 59,000 who made it to the 11 polling locations. That tally surpassed other May primaries, although there has not been a comparable May ballot that includes such a hot-button referendum. The early turnout left some observers wondering if this would be the election in which more than half of voters decided to go early, instead of on Election Day. A lingering question is how this referendum will compare to some of the other large decisions in recent city history. The English-only referendum, which was defeated, drew 73,912 voters in 2009. And the 1996 vote to bring an NFL team to Nashville brought out 125,913.